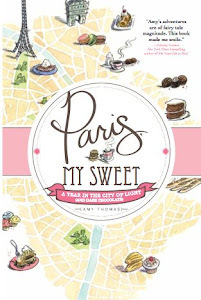 It’s been nearly two years since Paris, My Sweet was published. I still get the occasional shout-out and fan letter, and nothing makes me happier than reading them. 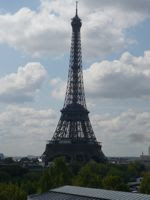 I also get happy when I read other Paris-based memoirs; I gobble each greedily, enjoying the thrill of visiting the City of Lights through someone else’s eyes and taste buds. There’s always a new dimension and perspective to discover, and yet it always brings me back to my two lovely years there. Such is the case with Janice MacLeod’s Paris Letters (out tomorrow). I loved reading it because Janice’s experiences and memories recalled so many of my own, but also because her path was so different from mine. We were both in our 30s, working in advertising, and made our way Paris, especially attracted to the flaneurs and food on the cobblestoned market streets (her, Mouffetard; me, Montorgeuil). While I thought I might fall in love with a French pastissier while living there (and, obviously, did not), Janice did fall in love—with a Polish butcher. They’re now happily married, living in the city of lurve. What’s more, Janice made a career for herself in Paris illustrating and writing beautiful letters, some of which are included in the book. 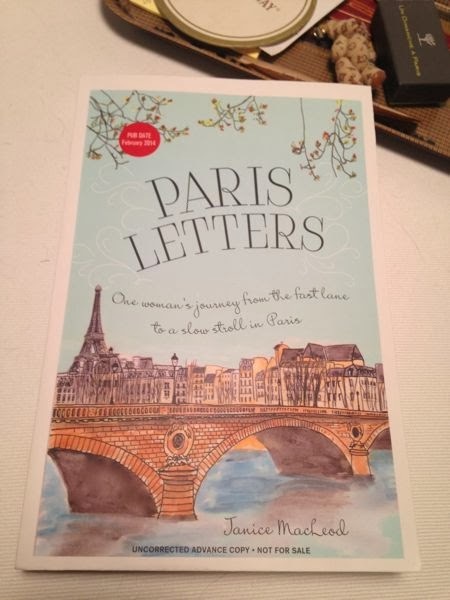 This, and her list of 100 ways you can save money to make your dream a reality, give Paris Letters that extra shine. She’s talented, cool and loves Paris like the best of us. Read a little of what Janice had to say about her tale before diving into the book itself. 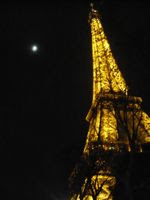 When you think back to your first days in the City of Light, what is your most vivid memory? I remember being so delightfully baffled when I first came to Paris. On every other street corner I was pulling out my map, trying to locate myself in reference to the monuments I was seeking. After about a week of this, I just relaxed and wandered, allowing myself to get lost. 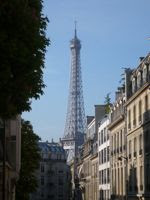 This was when I discovered the quieter Paris, just one street over from the bustling boulevards. This is where I found swan shaped desserts in bakeries, violin restoration boutiques, elaborate architectural details like dragons and angels, and freshly painted street art. And the day I had a baguette, still warm from the boulangerie… bliss! I couldn’t get over the fact that the French eat so well every day. You managed to achieve two dreams: the dream of going to Paris and falling in love, and the dream of ditching the unfulfilling job and following your bliss to career-happiness. Which dream has resonated more with your blog readers? Which do you cherish more? Blog readers love the love story, but they ask loads of questions about how they can ditch their unfulfilling jobs. I think a lot of people were sitting in cubicles wondering how they can pull it off, too. I tell them how I did it in Paris Letters. I look back on that time with great fondness. Saving up enough to quit... that was all me busting out my brute force for an intense year of restraint, ingenuity and tight-wad-ism. For me, finding the lovely Christophe was the greatest gift in this endeavor. I can’t imagine life with anyone else. We are so well-suited for each other, despite not speaking the same language. Even the linguistically hiccups are interesting. I recently describe for him the massive centipede I came across. I didn’t know the word for centipede so I used charades. You can’t not be happy when your relationship includes having to describe a centipede with charades. You mention sort of “mystical” things throughout Paris Letters; Do you think you have to be a certain kind of person to have the faith to move to a foreign city, or do you think anyone with enough moxie (and discipline to sell most of their personal items and skip dinners out as you did!) can do it? I think anyone with enough moxie can do it. For me, having faith in a sage guide gave me strength to carry on and to not panic when faced with challenging situations. Moving to a foreign city isn’t all quaint cobblestone streets. It’s also a labyrinth of subway tunnels to navigate, pickpockets, safety concerns and language barriers. It’s nice to imagine guardian angels helping me along and guiding me. I developed this “conversation” with sage voices in my head back when I was gearing up to leave my job and live abroad. This skill came in handy. It was a calm guiding voice that soothed my outer frenetic mind. What do you value most in the Parisian lifestyle? The pedestrian lifestyle. Paris is so kind in its offerings. Around every bend you’ll find an interesting boutique, café or boulangerie. Or you’ll come across a fountain or statue. The French have incorporated so many centuries into the present day. It’s a treasure to walk this city and discover something new every day. The city itself is a treasure. You struggled with the language, as did I. Now that you’ve been living there for nearly three years, is French becoming easier? The learning curve is slower than I imagined it would be, but I must keep telling myself that my French skills are much stronger than they were last year, and last year they were much stronger than the year before. With this reasoning, I must assume I’ll be much stronger next year. By now, I can get my needs met and have small light conversations, but I haven’t mastered the language. I try to look at learning it as a hobby. It’s less daunting that way. They say the best way to learn a language is “on the pillow.” I admit, it helps that Christophe speaks French. It also helps that we are patient with each other. We repeat, we describe, and yes, we use charades. We figure it out. 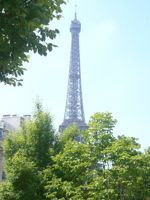 Any words of advice for other women who are looking to take that leap and move to Paris? Start taking language classes now, even if it’s just language CDs from the library. Tourists may be able to get by in simple English here for a few days, but living here is entirely different. You definitely need a basic understanding of the language the moment you get off the plane. The Latin Quartier, which is the fifth, but that’s likely because it’s my arrondissement. I love the notion that the world’s biggest thinkers lived in this arrondissement… and they still do. The Sorbonne students study in cafés, the Pantheon is the final resting place of many great thinkers, and let’s not forget Shakespeare & Company, the wonderful English bookstore by the Seine, across from Notre Dame, hotspot for greats like Hemingway. What’s not to like? Impossible question. There are so many and for different reasons. When I have tourists visiting, we love Les Deux Magots. It’s got a nice hustle bustle and great coffee and hot chocolate. When I’m alone, I find a café with a nice view of the street. Pedestrian-friendly streets like rue Mouffetard are best. On this street, the coffee and view from the TournBride café is best (104 rue Mouffetard). When I’m in an unfamiliar neighborhood, I often seek out Tabac shops. They usually have an old café in the back that is relatively unchanged from the first day it opened. Another impossible question. There are so many. I often stand on Pont Saint-Louis, the bridge that connects the two islands in the middle of the Seine. From here I can gaze at the flying buttresses of Notre Dame, watch the boats putter under the bridge, and watch a busker playing violin or an accordion. It a very peaceful place in Paris right smack in the middle of Paris. Nearby is the St. Regis Café… another favorite. What’s your favorite classic French dish? For lunch, I love to pop into a bistro for a chèvre chaud salad: Warm chunks of goat cheese melting on toast over a bed of greens. On a rainy day, of which there are many in Paris, I’ll pop into a bistro at lunch and order the cheesy onion soup. Another favorite is cassoulet, which is a fancy word for white bean stew. This dish originated in the south of France but is available everywhere in Paris and each restaurant seems to have its own version. I’ve never had two of the same. Favorite pastry, and which boulangerie/patisserie do you get it from? Impossible, impossible question! As you know, there are so many great pastries in Paris. And anything from Jacques Genin at 133, rue de Turenne. The mango toffee changed my life. Ah, now this is not impossible at all. My favorite journey is a simple walk up the street, hand in hand, with the lovely Christophe, finding a nice café, sitting down and watching the world walk by. Thanks for the heads up on this book! I will definitely be ordering it! A double treat when I was visiting some of the PARIS LETTERS tour stops today. I enjoyed and admired Janice's journey and even more so that she found a way to make her passions support this new journey, not easy at all to do. I hope there is a part II. I would be remiss Amy if I did not digress, have and loved your book it was a sweet treat indeed. Will look forward to reading the next books from you both. Thanks for the Tarte Citron tip. It's my favourite French pastry so it's always nice to know of a good place to try it whenever I'm in the city. I have actually been to Le Fumoir but just for drinks. Your Paris story sounds inspiring; so happy you shared it. Amy I truly loved your book, not only for "les bonnes adresses" of the patisseries in both Paris and New York, but mainly because of the solace I found through your experiences in trying to crack the French friend code. I found myself feeling alienated here in my attempts of securing a friendship network similar to home. Alas your book allowed me to realize that I was not alone....A sincere Thank You for that. I look forward to reading this novel for new experiences, but also for insight into living in this maddeningly beautiful city. What a delightful interview! As an Americaine who married a Parisian and has her heart set on living la vie Parisienne, this made me smile for all the wonderful things Paris is. I can't wait to read this book (downloading it now!) and immerse myself. It's great interview! I have to read this book :) and I am planning trip to Paris so it's really helpful!